Today, a Facebook post revealed that each Facebook user is an average of only 3.57 connections away from all users on the site. That by itself is interesting, but instead, Facebook’s comparing it to the popular theory of six degrees of separation—presenting its user base and the general population as two groups that, hell, may as well be considered one in the same! 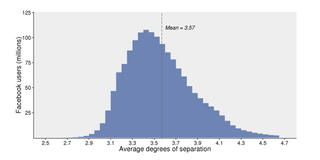 The post starts with a description of six degrees of separation: The notion that it takes just six social connections to link you with every human on Earth. But Facebook (which celebrates its twelfth birthday today) disagrees: “We’ve crunched the Facebook friend graph and determined that the number is actually 3.57.” At least among the 1.59 billion people on Facebook. Let’s break it down. First, of course the number of connections could be fewer, if the overall sample is smaller—1.59 billion isn’t the world’s 7.4 billion! (The Facebook post says, however, that apparently interconnectivity has grown as the user base has increased.) But still, groups that have more in common will obviously be more connected. In this case, people with enough internet access, free time, and the sheer interest of owning a Facebook account. Personally, I would’ve been super interested if Facebook was using its mathematicians and social networking wizards to try and debunk the six degrees theory (which is already kinda sketchy and flawed) on a wider scale, going beyond the boundaries of Facebook and proving that we all are actually more connected than we think. And hey, maybe the happy rainbow unity magic of the internet might actually have something to do with it. Instead, this is Facebook’s latest attempt to make us think the site is a basic part of the human experience.